Prometheus: Afraid of its Own Ideas? Prometheus opened in theaters Friday, and I went to see it yesterday after skating practice. Directed by Ridley Scott of both Alien and Blade Runner, and written by Jon Spaihts and Damon Lindelof, this prequel to Alien is set in the same universe. It’s rounded out by a sweeping and ominous score by Marc Streitenfeld. I have both praise and criticism. First of all, you need to see this movie in the theater. You don’t need to see it in 3D. Prometheus tells the story of a space mission seeking the answer to an age-old question: where did we come from? The title is the name of the ship, which comes from the Greek myth of Prometheus, punished by the gods for creating man from clay. 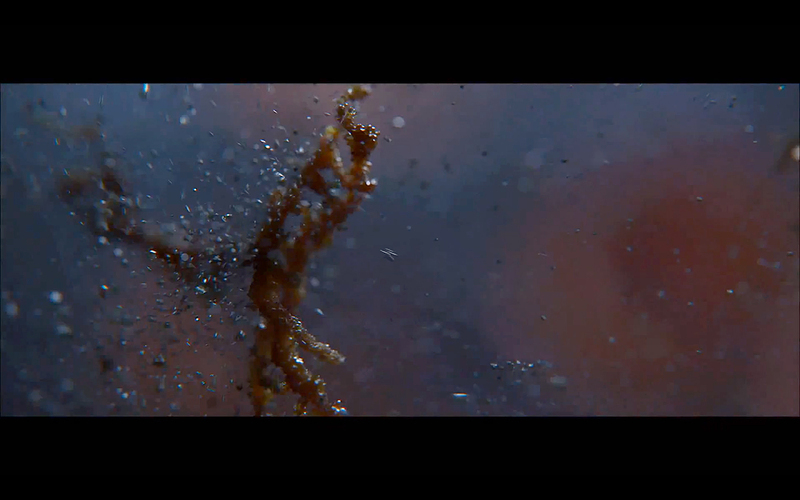 Breath-taking overhead shots of a primordial landscape open the film. Gradually we zoom in on a humanoid creature picking its way along the edge of an enormous waterfall. It drinks a black liquid, deteriorates in agony, and falls over the edge. DNA strands permeate the water. A recurring motif of stars in ancient artwork is discovered by archaeologists and lovers Elizabeth Shaw (Noomi Rapace) and Charlie Holloway (Logan Marshall-Green). They trace the configuration to a distant system containing rocky planet LV-223. Along for the ride are practical captain Janek (Idris Elba), surly geologist Fifield (Sean Harris), nerdy biologist Milburn (Rafe Spall, son of Timothy Spall) and Charlize Theron as Meredith Vickers, a coldly corporate mission director. Michael Fassbender is David, an android who looks after things while the crew is in stasis. The acting is sincere. Viewers may recognize Rapace from the Swedish adaptations of The Girl with the Dragon Tattoo, et. al. Her Shaw is likeable, though not as tough as Ripley. Theron is always a pleasure to watch. Marshall-Green is appropriately excited without being too cocky. The rest of the cast has a lot of personality for such token characters. Fassbender steals every scene he’s in. His David idolizes T.E. Lawrence, and echoes Ash, the rogue android from Alien, Data, Star Trek: The Next Generation’s humanoid wanna-be, and HAL from 2001. We can’t determine if he has emotions or not. One decision smacks of pure spite, but could also be seen as clinical curiosity about the consequences. Much of the film was shot in Iceland, an area of Earth still close to its primordial state. It makes a decent substitute for LV-223. Set designers revisited the biomechanical style of Swiss surrealist H.R. Giger, who designed the derelict ship in Alien and the xenomorph we know so well. Giger himself produced the alien murals on LV-223. Prometheus tackles big ideas, namely the theory of ancient astronauts who spread their DNA to earth and originated our species. This idea is a natural outcrop of panspermia, that Earth and / or other planets may have been seeded long ago by asteroids carrying life ingredients around the universe. It also briefly touches on the idea of humans assuming this god-like function, and how appallingly naïve they are about it. David asks Holloway why he himself was created. “Because we could,” is the flip reply, with Holloway not understanding the depth of what he has just said. In time, LV-223 reveals many of its secrets. Here is where the script collapses away from philosophizing and into frenetic, action/horror mode. I found myself laughing at one unnecessary scene. Horror directors always seem to make this same mistake: inserting a crazy aside. A good example is the pharmacy scene in The Mist, which brings the story to a screeching halt to show you a really gross special effect, thus evaporating the tension. I expected better from Scott. Anyone who saw Alien will recognize certain things on LV-223. 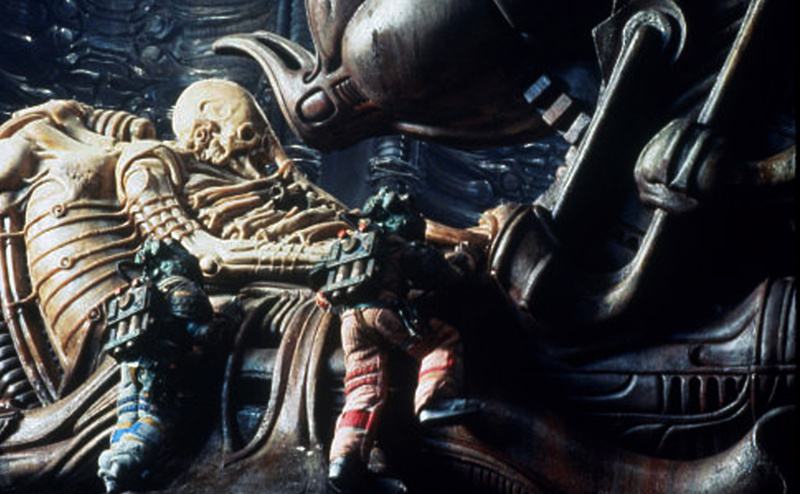 The identity of the space jockey, a giant fossilized being discovered on LV-426 by the Nostromo crew, is finally revealed. “Wonder what happened here?” You don’t wanna know…. But one gaping question is left unanswered, and Scott leaves the ending somewhat open. I was disappointed, because I was hoping for answers NOW. I’m still intrigued. I would have liked to see what happened if it hadn’t ended the way it did, without waiting for another film. 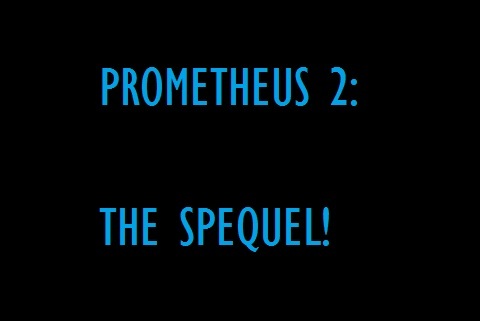 I smell a sequel…but what would you call a sequel to a prequel? It seemed to me that Prometheus sits on the very edge of being really profound through the entire first half, especially with that opening scene, but never takes the plunge. Instead, it lapses into comfortable, sci-fi stereotypes. The subsequent action eclipses the idea of the mission and becomes clichéd, predictable and non-scary. I didn’t hate it. But I didn’t love it, either. This entry was posted in Art and Artists, Film and Television and tagged Alien, Charlize Theron, Logan Marshall-Green, Michael Fassbender, Noomi Rapace, Prometheus, Ridley Scott by A. Elizabeth West. Bookmark the permalink. I am mulling over my own review for Prometheus. Unlike yours mine will be full of spoilers. One thing. I think Prometheus was punished by the gods for giving humans fire. I could be wrong Greek mythology is just a tad outside of my cultural myth zone. 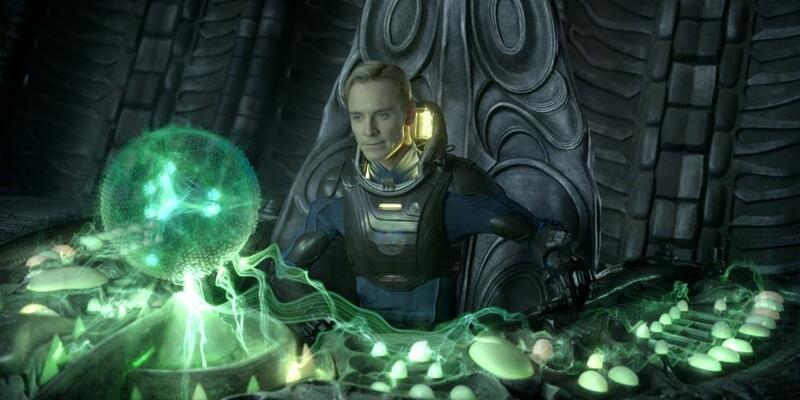 What sets apart Prometheus from the other Alien films is also what causes it to fail. Alien was a simple film, haunted house in space. Aliens was war movie but both were more about simple survival. Prometheus sank under the weight of its own grand idea. The grand idea of finding our origins became the eagle eating the liver of Prometheus. I guess it is time to write my review…. I think there are different versions of the Prometheus myth. Anyway the gods didn’t like what he did. I think the movie would have been great had they gone further with the idea. The philosophical ramifications are awe-inspiring. It had such promise at the beginning, but then became predictable. I’m struggling with this in my WIP. There are things that will definitely mess with aspects of people’s faith, but I’m afraid it’s degenerating the way this did. Also, I’m mad because I still don’t know how the original space jockey GOT to LV-426. I guess that will come out in the spequel. prometheus is a sci fi movie. it is not a horror movie. it is not a war movie. it shares dna with these things, but is is not the same. this is the mistake people are making. finally saw it on video, and other than the terribly misfit scene with space hash and the alien cobra, its pretty much everything i could hope for. That’s why I was so disappointed. It started out in sci-fi mode, but then dropped back into horror and lost steam. Alien (the first one) WAS a horror movie, with a sci-fi setting. The second one was an action film. Both are superior because they stayed in that mode. Prometheus missed its chance to carry through–it tried too hard to be ALL those things, and that just didn’t work. Sequel is to be called Paradise. Supposedly Fox have already commissioned the script. Lol …. Whatever they started preselling the Blu-Ray a coupl’a Weeks before the movie had even come out. I wonder if we’ll get to see the space jockey planet. That would be cool. I still want to know how the original space jockey got to LV-426. Could be. I could have done without the zombie thing, though. That was just a stupid distraction. So was the squid abortion.